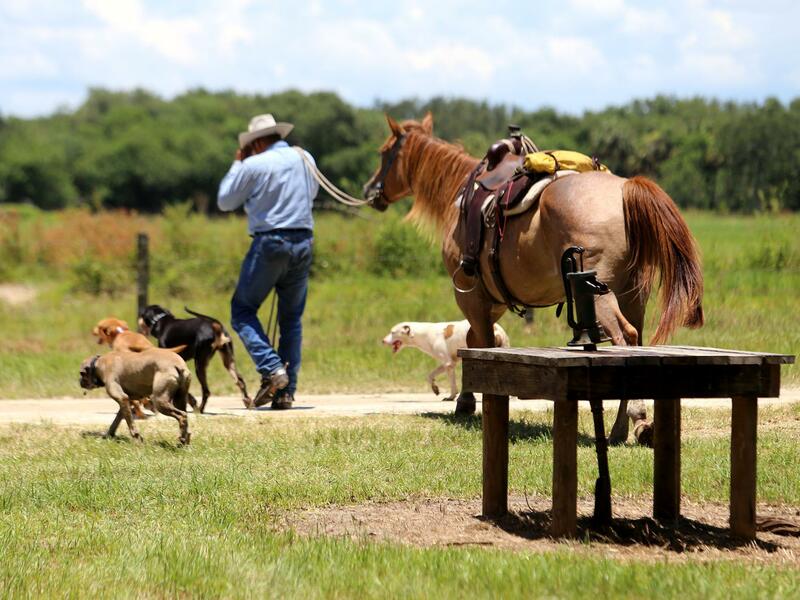 Chris Green, a tribal member, and his son get the dogs out early to round up a herd at Big Cypress Reservation. Spurs on the boots of Norman "Dad" Johns. Adam Turtle and Stanlo Johns, 82, examine the herd at the cattle pens at Brighton. Johns helped establish the modern herd back in the 1950s; Turtle is a Seminole cowboy. It's traditional for family owners, cowboys, foremen and guests to eat together in a giant potluck provided by the family owners. Popular Seminole foods, besides the beef, are Indian fry bread, pumpkin bread, Spam and tomatoes, and sofki, a corn drink. People gather each day over two weeks, minus weekends, taking turns at both the Big Cypress and Brighton reservations (this is Brighton). Alex Johns, 42, is the tribe's natural resources director and ranch manager. 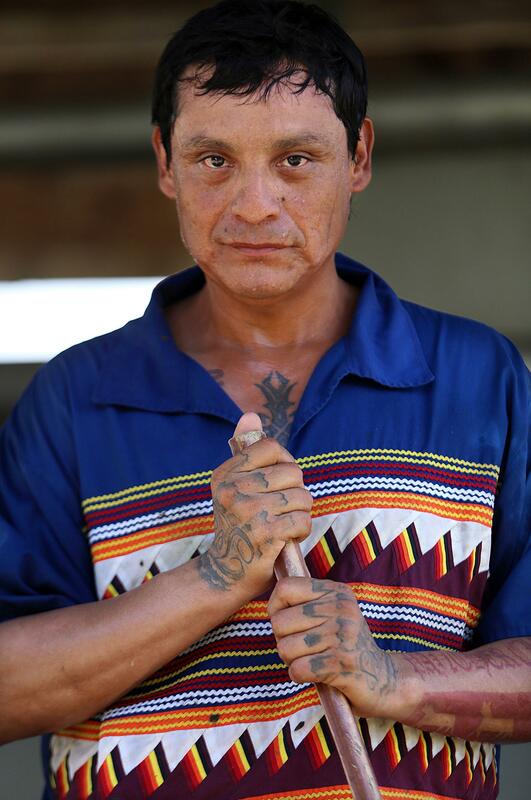 He's a tribal member, who's been improving the Seminole herd for 17 years. The tribe has about 10,000 head of cattle. Johns is also an officer with the Florida Cattlemen's Association. Joe Osceola, 40, wears a traditional Seminole Patchwork shirt while herding cattle at the weigh station at Brighton. Alex Johns mans the pen at the weigh station at Brighton. The tribe shipped 40 trucks of 50,000 pounds of cattle to feedlots out West — that's about 2 million pounds. The "Brangus" calves were sold in April and shipped when they weigh 500 pounds and up. Some steers (male calves) are as heavy as 800 or 900 pounds. About 20 percent of Seminole beef winds up in the tribe's own boutique line, called "Seminole Pride" beef. 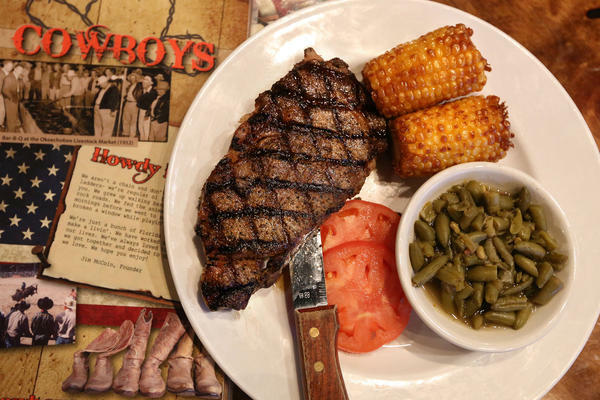 It's on offer in about 200 Florida restaurants, including Cowboys BBQ & Steak Co. in Okeechobee. Andre "Dre" Jumper, 20, of the Big Cypress Reservation is Moses Jumper's grandson. He loves being a cowboy. Cattle work at the Seminole Tribe of Florida's Big Cypress Reservation. Naha Jumper gave in when a cow and three calves jumped through a barbed-wire fence to escape being herded. But he got them the next day. Tribal member Chris Green and friend, Vigil Phillip Birch II, who goes by Shaggy, chase after breakaway cows in the Jumper pasture at Big Cypress with their herd dogs. Chris Green, a tribal member, and his son, Clayton, get the dogs out early to round up a herd at Big Cypress Reservation. A cowboy with spurs, herd dogs, a horse, and a pump that actually works. Norman "Dad" Johns wags a finger to signal "steer," with Adam Turtle below him. 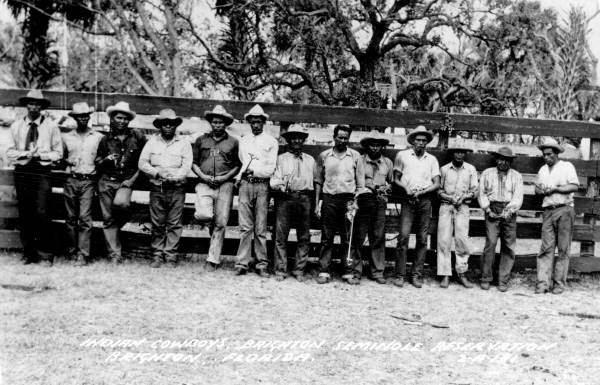 Seminole cowboys hold individual branding irons, Brighton Indian Reservation, 1941. Naha Jumper, 41, and his father, Moses, 64, chase after some uncooperative animals who keep retreating into the woods. 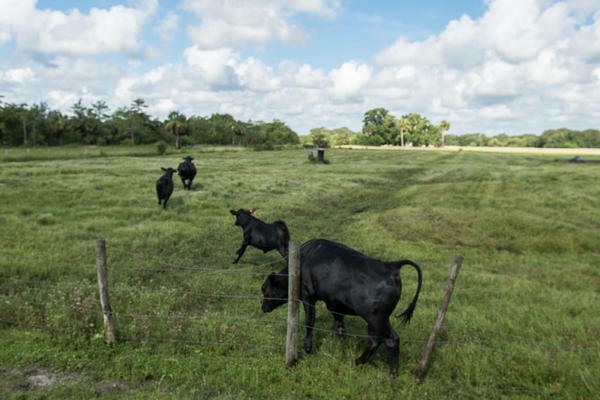 Florida cattle are shy, and face dangers like bears and even panthers. Recently, on a hot summer morning with cumulus clouds towering overhead, black cattle grazed in South Florida fields, dotting the horizon along with clumps of palm trees. At the Big Cypress Reservation, Moses Jumper is a tribal elder and owner of nearly 300 head — and a fourth-generation cattleman. "A lot of people look at us as wrestlin' alligators, and the casinos and all that. 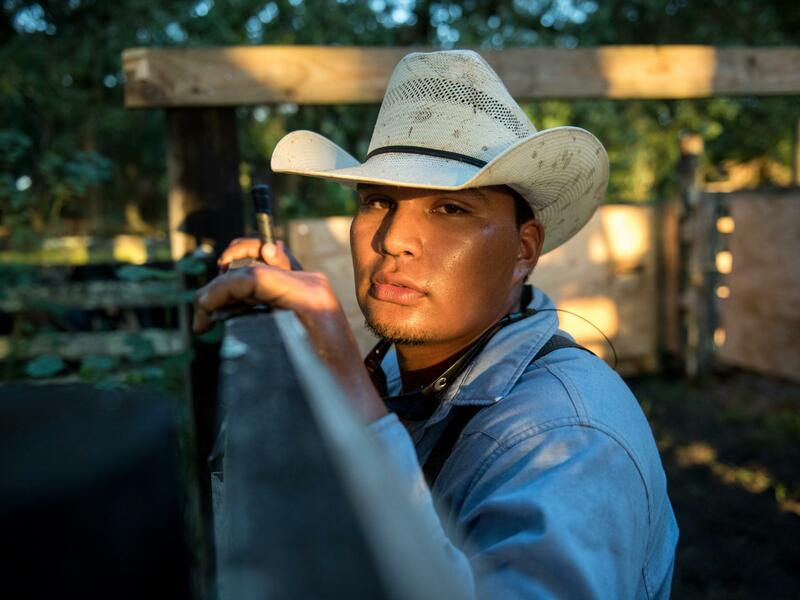 But a lot of people don't realize we've been deeply involved with cattle all the way back to the 1700s and 1800s," says Moses Jumper, beneath pictures of his forebears wearing Seminole tribal dress. "Cattle in my family goes all the way back to my great uncles. My grandmother and grandmothers. They were all cattle people." 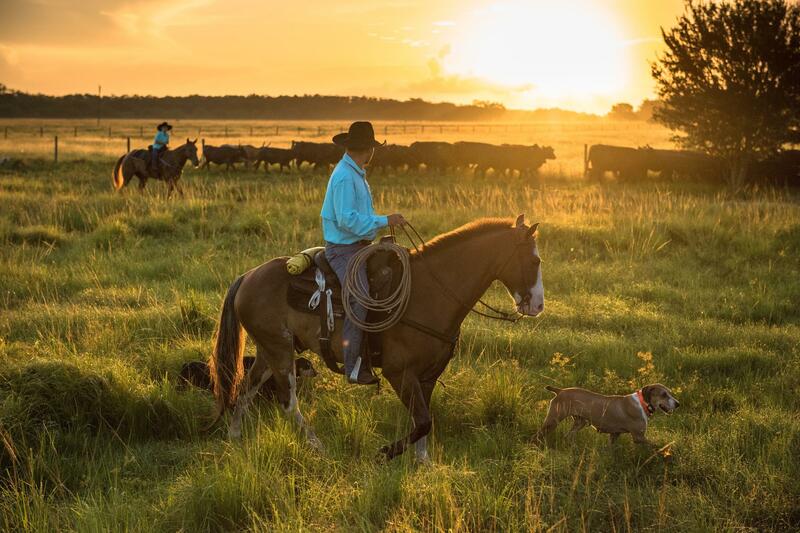 On the Seminole reservations of South Florida, July and August are cattle roundup time. Cattle roundups and cowboys usually bring the Old American West to mind. But the first cattle, historians believe, entered what is now the U.S. through Florida with the Spanish Conquistadors in the 1500s. 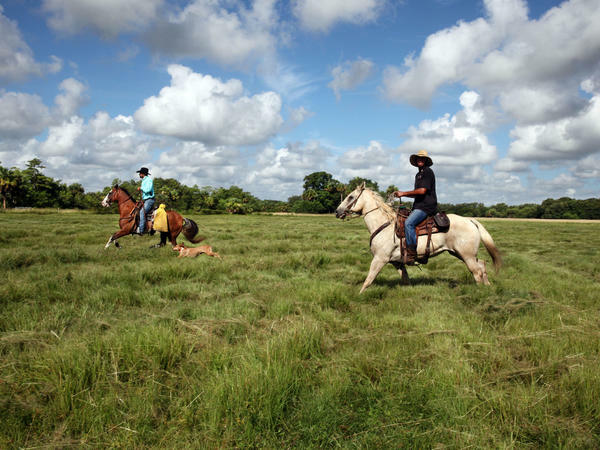 The earliest Florida cowboys were native people. And they're still at it. Florida, with its lush grasslands, ranks 10th in the nation for its beef cattle herds — nearly 2 million head. 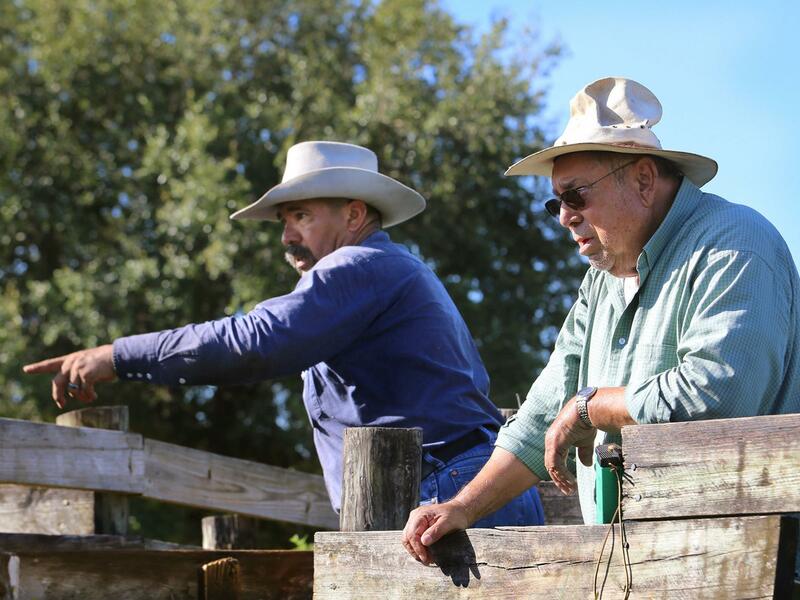 The Seminole Tribe of Florida Inc. is a major player in the cattle industry. "I don't know if we were the only — but one of the few — that never did sign a peace treaty with the U.S. government, " says Alex Johns, natural resources director for the tribe. "We wasn't recognized American citizens." All Native Americans have been U.S. citizens since 1924. "So, even though we'd been living here for 10,000 years, we were considered enemies of the state." The 36,000-acre Brighton reservation, with an abundance of grassland and natural roughage, is 75 miles north from Big Cypress, near Okeechobee. It's where the modern cattle herd was begun in the 1930s, even before the Seminole Tribe of Florida was federally recognized and incorporated in 1957. 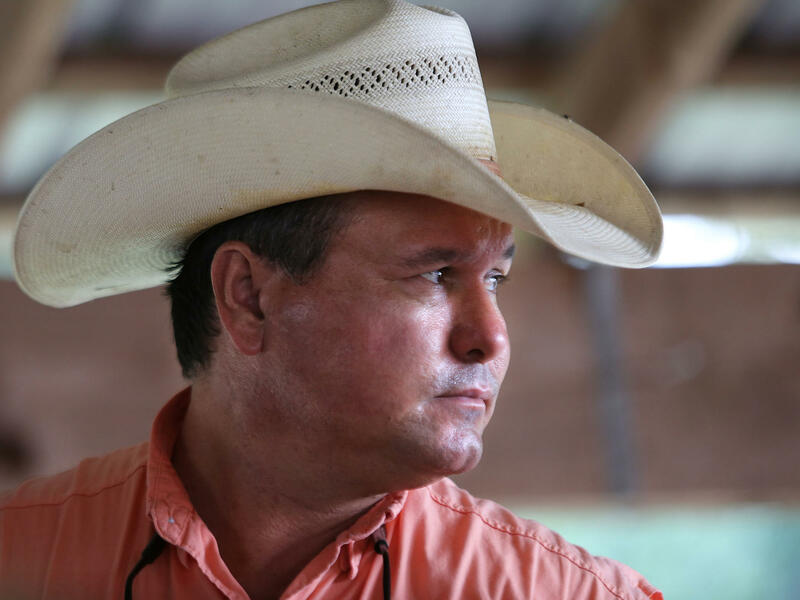 Alex Johns, 42, was born at Brighton, and is an officer with the Florida Cattlemen's Association. "We got the [U.S. government] to quit killin' us. They acquired this property and worked with us to have cattle — they actually brought cattle in from the Apache Mescalero reservation," said Johns. "And that was the carrot that got my people to come to the Brighton reservation." Those Apache cattle weren't nearly adequate, and many died. It took decades of trial and error, different breeds and better genetics for the Seminoles to get the quality reputation they have today. The Seminoles raise a hardy breed called "Brangus," a cross between Brahmin and Black Angus — about 10,000 of them. They're sold on the Internet in the spring. They have tags in their ears tracing their lineage. And every summer, over a two-week period, roundup comes at first one reservation and then the other, including all the family cattle owners as one big collective. This year, there were 67 families participating. This is Florida, and it's superhot. Even before first light, cowboys in pickups show up with their horses, a few wearing spurs and some wearing white rubber boots and spurs. The white boots, called "Lakeport Loafers," are for swampy water. Spurs are jingling. The herd dogs are already baying loudly. Skeeter Bowers, a cattle owner and tribal member at Brighton, loves it. "To the average person, when they think Florida, they think of Mickey Mouse and sunny beaches. But this is the real Florida." Here, are the savannas — the grasslands — and they stretch as far as the eye can see. Skeeter Bowers stands in a pen in front of hundreds of noisy, lowing calves at Brighton's sorting pens, and does a kind of play by play. "You're going to hear 'heifer heifer heifer — cow cow cow,' and 'steer steer steer.' " What he means is, the maturing "feeder" calves are being separated from the "momma" brood cows, and at 500 pounds and up, the 7- and 8-month-old calves are ready to be sent to feed lots and buyers. They come thundering down various lanes. Cowboys sort them out with hands, hats and cattle prods. Three generations often work together, like Stanlo Johns, 82, his son, Todd, 46, and assorted grandchildren. "You've got to do what you love," says Stanlo. He credits the University of Florida with helping the tribe. Son Todd is jumping to the fence rails to avoid getting trampled, as cattle, four or five at a time, rush past. Stanlo's younger brother, Norman, called "Dad," holds up a finger — one for steers, two for heifers (female cows under a year old). Into the pens they go, and, later, to the weigh station and then the livestock trucks. The cicadas whine and cattle low. At Big Cypress, there's a dramatic breakaway one morning in the Jumper fields. 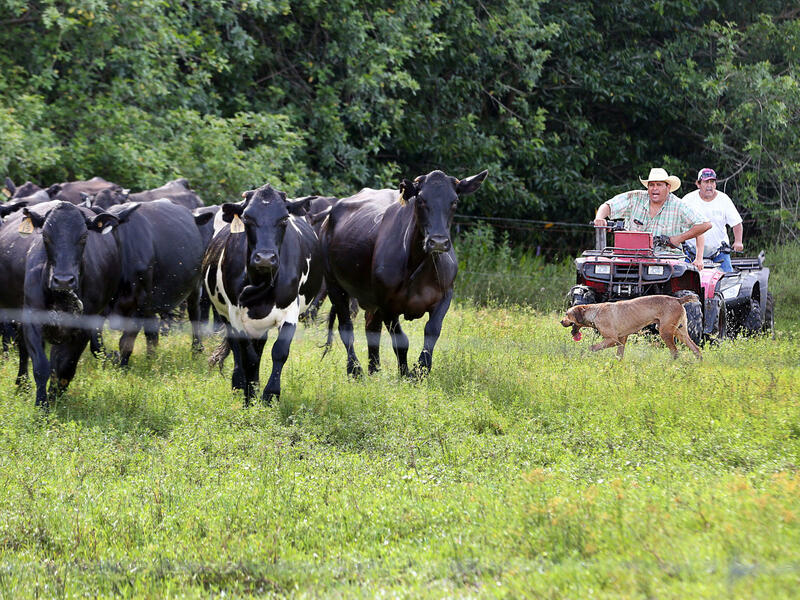 Moses and Naha Jumper are moving the herd from one pasture to another, using their four-wheel ATVs, when "resistors" have other ideas, bolting toward the oak forest. Cowboys go chasing after escaped cows on horseback, only to give up when some of the cattle jump through a barbed-wire fence. Naha Jumper, 41, calls it quits. It's almost noon. "We'll get 'em tomorrow," he grins. "Let's get some lunch." He's been chasing after cattle on an ATV all morning, and it's heading toward 100 degrees. Lunch each day is a giant potluck including traditional foods like Indian fry bread, pumpkin fry bread, Spam and tomatoes, and sometimes a corn drink called Sofki. Everyone eats together, from cowhands and foremen to family owners and guests. Moses Jumper leads everyone in a cowboy prayer. "Let's all take our hats off," he says gravely. There are a lot of cowboy hats. "Father, we're breaking bread together — we know you're the creator of all things. We pray you keep us safe in the cow pens, and we pray the cattle be safe. Cowboying is a tough job — but Father, we pray for your protection, in Christ's name." Gathered around him are granddaughters and grandsons. He hopes they'll all be cattle owners as he is. This year, the tribe had a lot to be grateful for. Heavier calves, filling 40 trucks, bound for feedlots out West meant a gross of at least $3 million. It's not casino profits, but it's legacy. But, Moses says, most people aren't doing it for money, and there are years when he hasn't made any on cattle. In recent years, that's changed, but it's not the whole point. "I get out there on my four-wheeler with my dogs, and it's the place for me to be. I enjoy it. Hopefully when the Lord calls me home they'll find me out there in the fields, doing what I love to do." That sounds like it could be a cowboy from anywhere. In this case, it's a Seminole Indian Florida cowboy. When we think of the old West, we often think of Texas cowboys, but the first cattle came to the North American lands through Florida with the Spanish conquistadors. 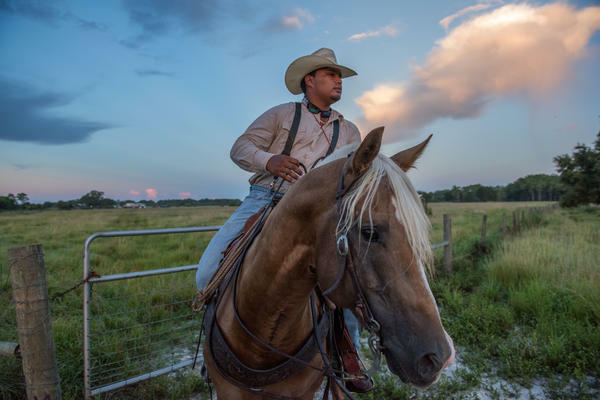 Some of the first cowboys were Florida's Seminole Indians, and today the Seminole tribe continues to play a major role in Florida's cattle industry. Jacki Lyden reports on the tribe's annual two-week round-up. JACKI LYDEN, BYLINE: It's early morning and cumulus clouds tower over us in the Everglades. Alligator Alley, as it's called, is a stretch of I-75 between Naples, Fla., and Miami. Snake Road leads to the Big Cypress Reservation where the Seminoles have their pastures. Black cattle dot the landscape. They're striking against stands of palm trees. The gate is painted in red, black and yellow - traditional colors. It says Jumper - Moses Jumper 64. He's a cattleman and tribal elder. 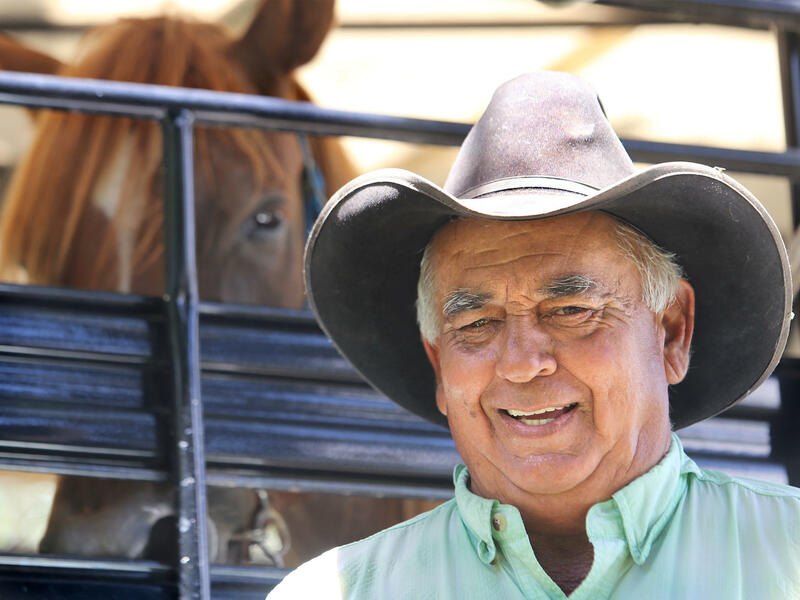 MOSES JUMPER: A lot of people look at us as wrestling alligators and the casinos and all that, but a lot of people don't realize that we're - we've been deeply involved with cattle all the way back into the 17 and 1800s. Some cattle in my family goes back all the way to my great uncle's and my mother and grandmother's. They were all cattle people. 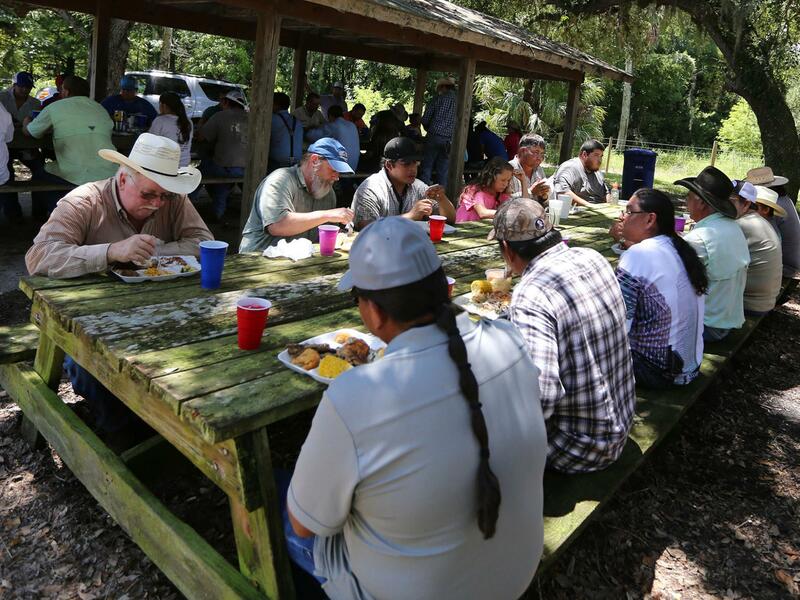 LYDEN: The tribe's rich grasslands are surrounded by huge commercial Florida cattle operations, yet no one has been at this longer than the Seminoles - about 500 years. The Spanish conquistadors brought cattle to Florida in 1521 with Ponce de Leon and used natives to herd them. There are records from explorers of the late 1700s of thousands of cattle belonging to the Seminole leader called Cowkeeper. But those historic herds vanished with several wars against the Seminoles by the U.S. government, which nearly wiped out the tribe in the 1800s. Alex Johns, the tribe's ranch manager picks up the story. ALEX JOHNS: I don't know if we're the only, but one of the few that never did sign a peace treaty with the United States government. We wasn't recognized American citizens, even though we'd been living here for 10,000 years. We were considered enemies of the state. LYDEN: In 1957, the Florida Seminoles negotiated formal recognition by the government. The cattle program began in the 1930s at the Brighton Reservation near Lake Okeechobee. JOHNS: Well, the government quit trying to kill us, quit trying to run us off this land. They acquired this property and worked with us to have cattle. They actually brought in a bunch of drought-stricken cattle from New Mexico from them Mescalero Apache Reservation, and that was the carrot that got my people to come to the Brighton Reservation. LYDEN: It took decades, but today the Seminole raise a hardy breed called Brangus, a cross between Brahmin and Black Angus. 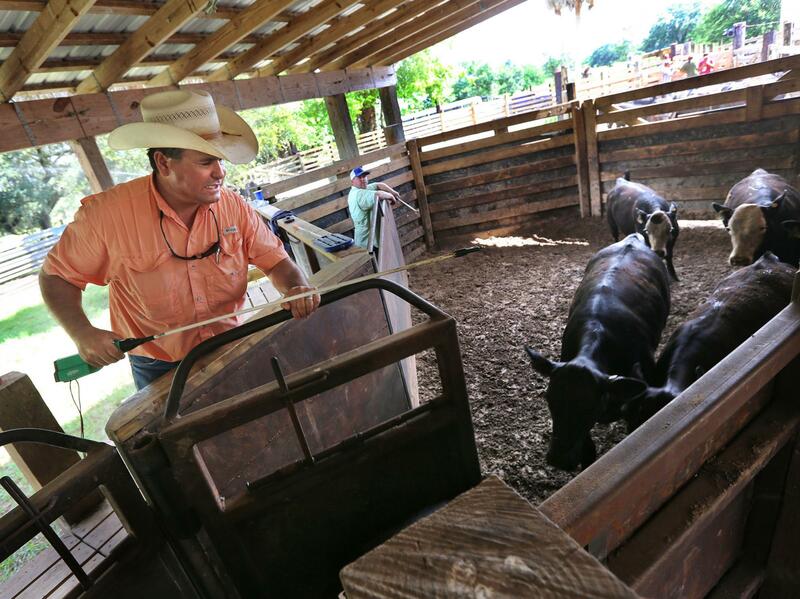 This summer, 67 Seminole family owners took part in the annual round-up of the maturing calves. At first light, cowboys in pick-ups show up, some wearing spurs over their white rubber boots which are for swampy water. First, they let the dogs out. Skeeter Bowers says this is the real Florida. SKEETER BOWERS: To the average person, when you say Florida, they think of Mickey Mouse and sunny beaches. BOWERS: But really this is Florida right here. LYDEN: Skeeter Bowers stands in a pen in front of hundreds of noisy calves at Brighton. 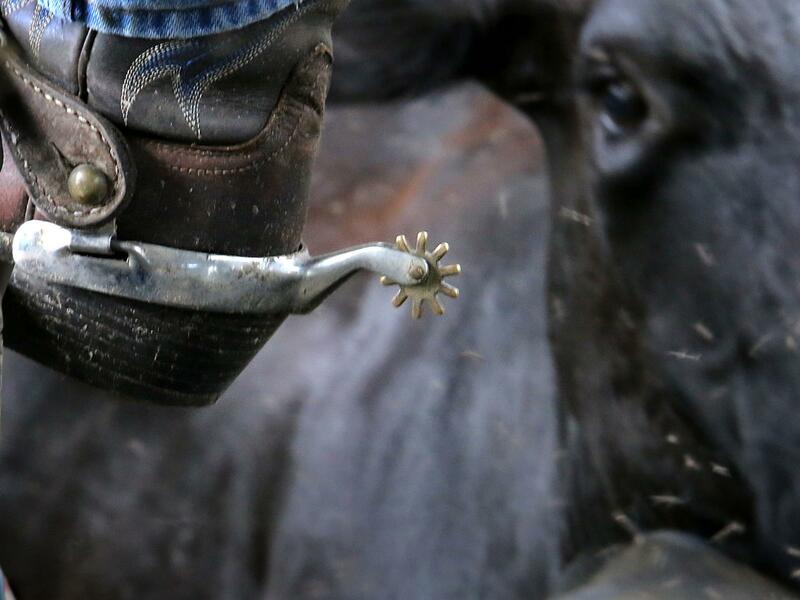 Cowboys brandish whips and cattle prods as scores of calves and brood cows, the mothers, are separated through sorting gates. Skeeter does a kind of play by play. BOWERS: You're going to hear a cowboy saying cow, cow, cow and then he's going to say steer, steer, steer, steer. And then he's going to say heifer, heifer, heifer. LYDEN: Product from the herd, four or five at a time, cattle come thundering down wooden alleys. It's pulse-driving, heart-stopping work in 100-degree heat. 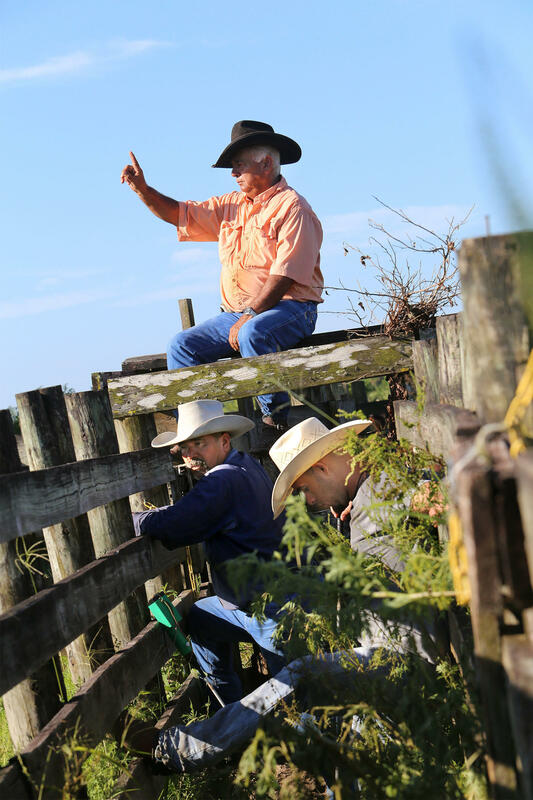 At the last minute, a cowboy might leap to a fence rail to avoid getting trampled, three generations working together. Sometimes it's not even disorderly. Seventy-five miles away, morning saw a dramatic scene at the Jumper ranch. Cowboys raced by on their horses in hot pursuit of strays. Cattle escaped from the pastures into the deep woods. A cow and three calves jumped clear through a barbed wire fence. Naha Jumper, 41, who'd been chasing them on an ATV with his father, downplayed it. NAHA JUMPER: So far, so good. We kind of got a little breakaway over here, so we're going to have to go back there a little bit when it cools off. Right now it's little bit hot, so I'm going to let him wait and go eat some lunch. LYDEN: And on round-up days, lunch is always a giant potluck. Each owner's responsible for traditional dishes like fry bread, pumpkin bread, Spam and tomatoes and a corn drink called Softki. Everyone - cowhands, foremen, and families - eat together under the trees near the cattle pens. There was a cowboy prayer led by Moses Jumper. LYDEN: The tribe had a lot to be grateful for. The calves weighed more this year, filling 40 livestock trucks bound for feedlots out West. They grossed at least $3 million. But there have been years when Moses Jumper couldn't even cover his expenses. It doesn't really matter to him. M. JUMPER: I get out there on my four-wheeler, you know, with my dogs, and it's a place for me to be. I enjoy it. Hopefully, when the Lord calls me home, I'll be laying out in the field somewhere, and he'll find me there doing what I love to do (laughter). LYDEN: That sounds like a cowboy anywhere. In this case, it's a Seminole-Indian-Florida cowboy. For NPR News, I'm Jacki Lyden. CHIDEYA: This reporting was made possible in part with the support from the Florida Humanities Council. Transcript provided by NPR, Copyright NPR.